only be converted to usable product but two valuable metals can also be recovered from it. 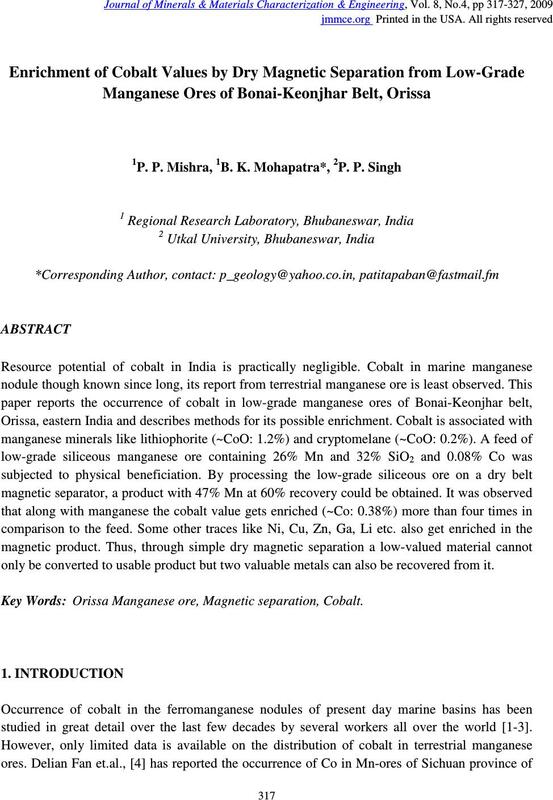 Orissa Manganese ore, Magnetic separation, Cobalt. studied in great detail over the last few decades by several workers all over the world [1-3]. development and mining has been suggested by Tetsuo . 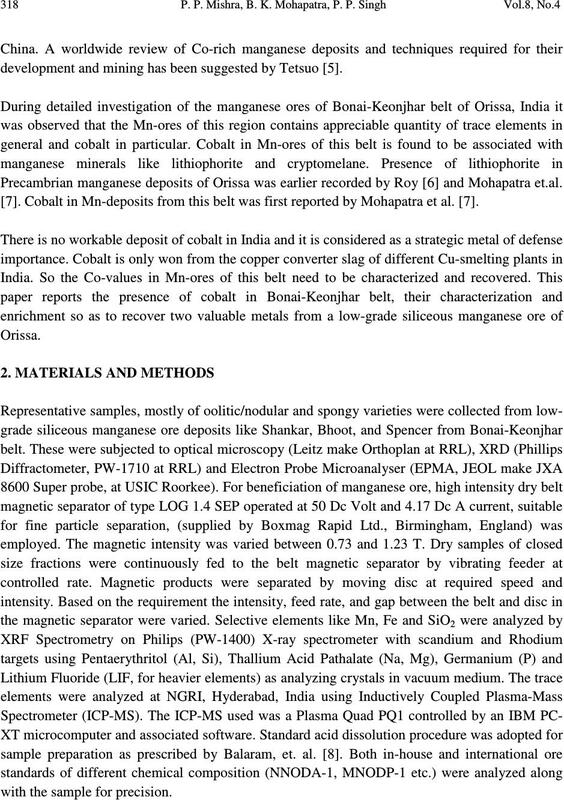 Precambrian manganese deposits of Orissa was earlier recorded by Roy  and Mohapatra et.al.
. Cobalt in Mn-deposits from this belt was first reported by Mohapatra et al. .
with the sample for precision. 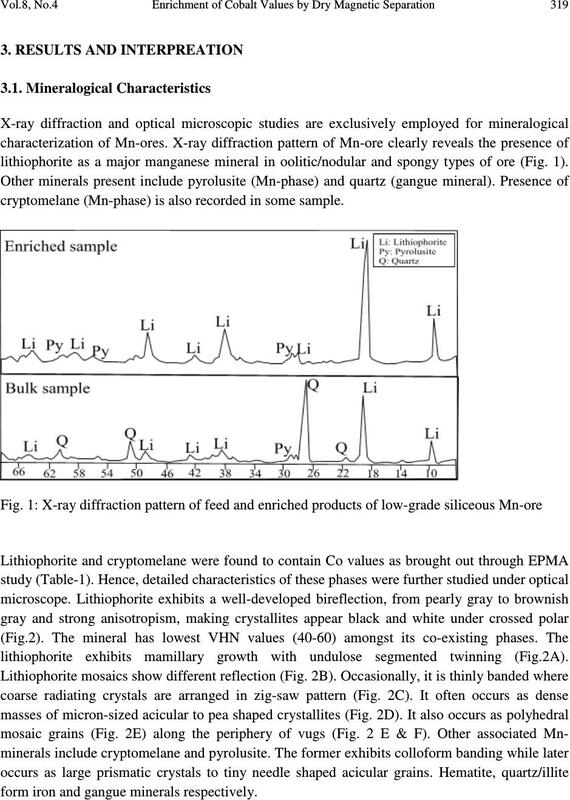 lithiophorite as a major manganese mineral in oolitic/nodular and spongy types of ore (Fig. 1). cryptomelane (Mn-phase) is also recorded in some sample. 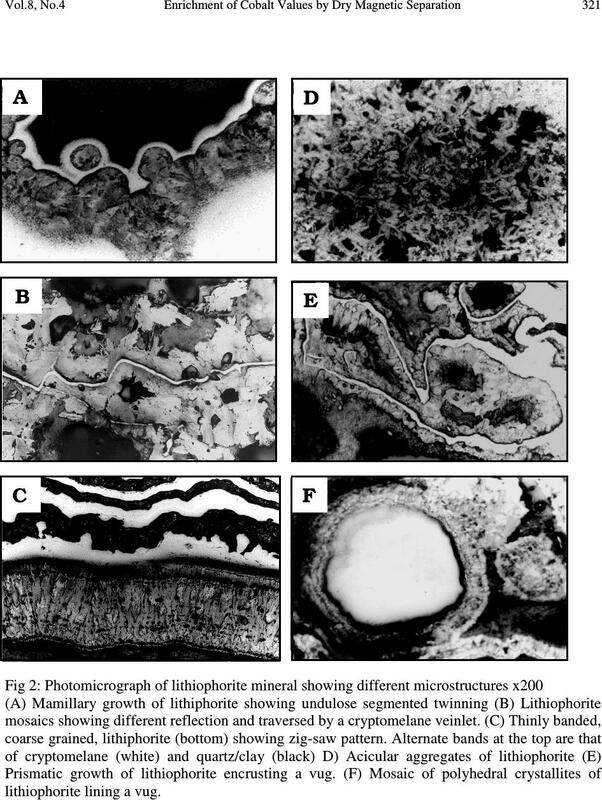 lithiophorite exhibits mamillary growth with undulose segmented twinning (Fig.2A). form iron and gangue minerals respectively. 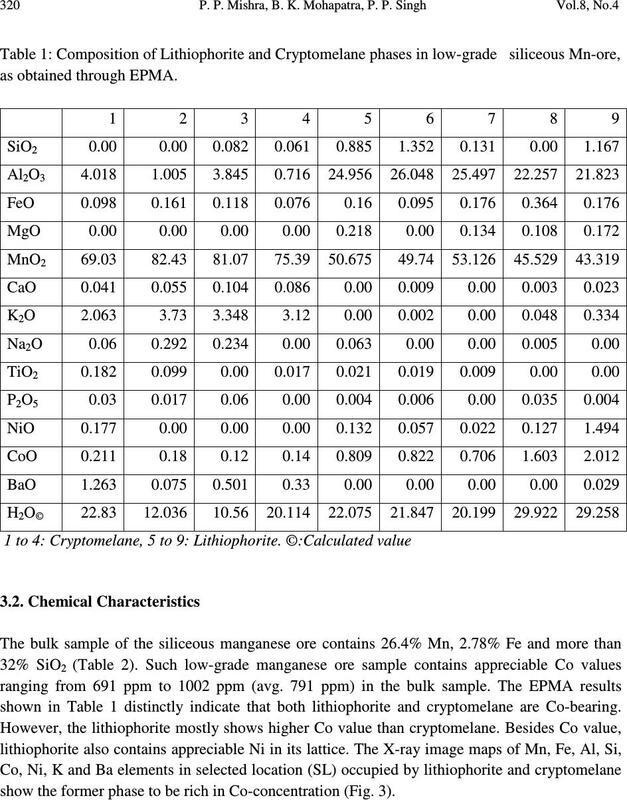 shown in Table 1 distinctly indicate that both lithiophorite and cryptomelane are Co-bearing. show the former phase to be rich in Co-concentration (Fig. 3). are given in Table-3. 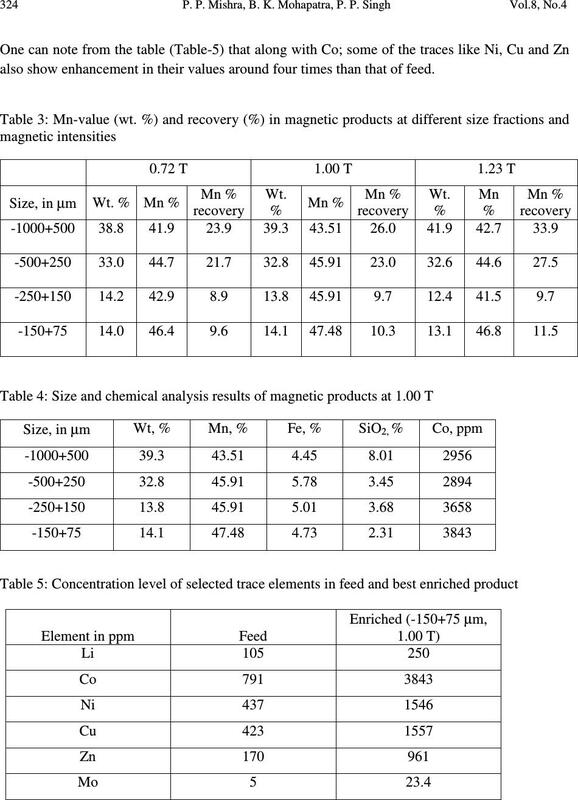 It can be seen from Table-3 that best grade of Mn-ore is obtained at 1.00 T.
trend line. This further substantiates the adsorption of Co values in Mn-phase. Ba. 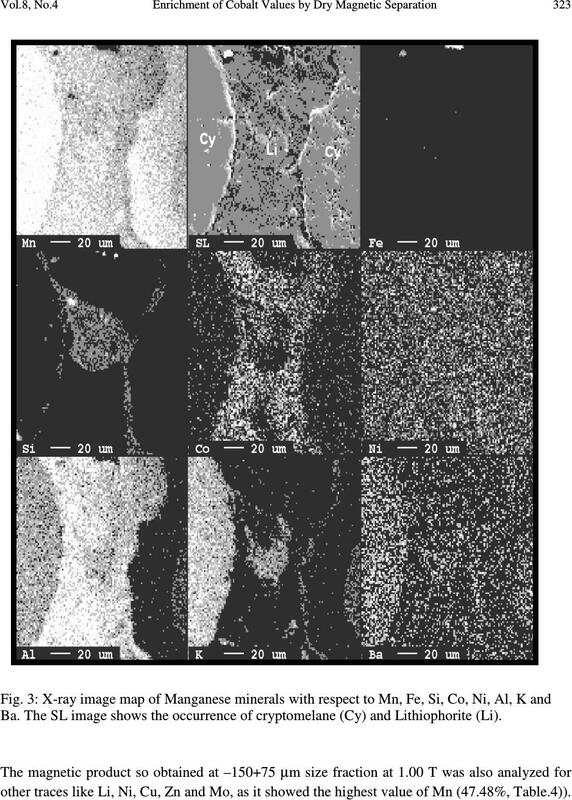 The SL image shows the occurrence of cryptomelane (Cy) and Lithiophorite (Li). other traces like Li, Ni, Cu, Zn and Mo, as it showed the highest value of Mn (47.48%, Table.4)). also show enhancement in their values around four times than that of feed. processed product (–150+75 µm size fraction at 1.00 T) is definitely a significant achievement. ppm through simple magnetic separation technique. (Ni, Cu & Zn) has been recorded in the enriched product with respect to the feed sample. further adds to the value. 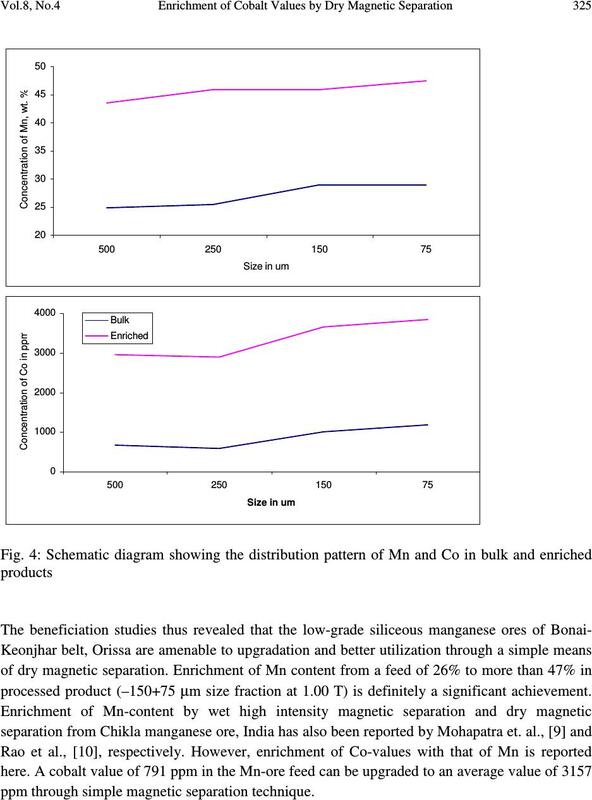 conversion of a part of manganese ore from this part of India deserves further detail study. biological, electro-metallurgical and hydro-metallurgical process routes. and marine sediment.” Nature wissenschaften, Vol. 65, pp. 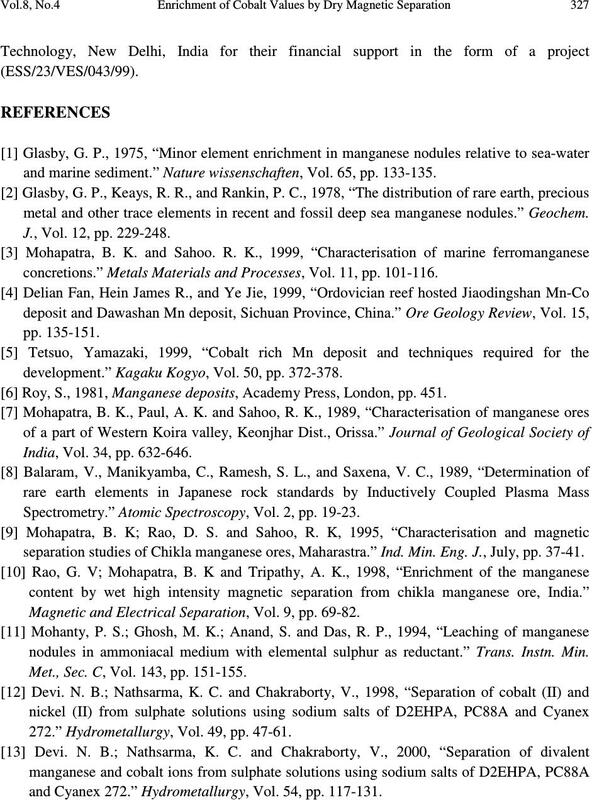 133-135.
metal and other trace elements in recent and fossil deep sea manganese nodules.” Geochem. J., Vol. 12, pp. 229-248.
concretions.” Metals Materials and Processes, Vol. 11, pp. 101-116.
development.” Kagaku Kogyo, Vol. 50, pp. 372-378. Roy, S., 1981, Manganese deposits, Academy Press, London, pp. 451. India, Vol. 34, pp. 632-646. Spectrometry.” Atomic Spectroscopy, Vol. 2, pp. 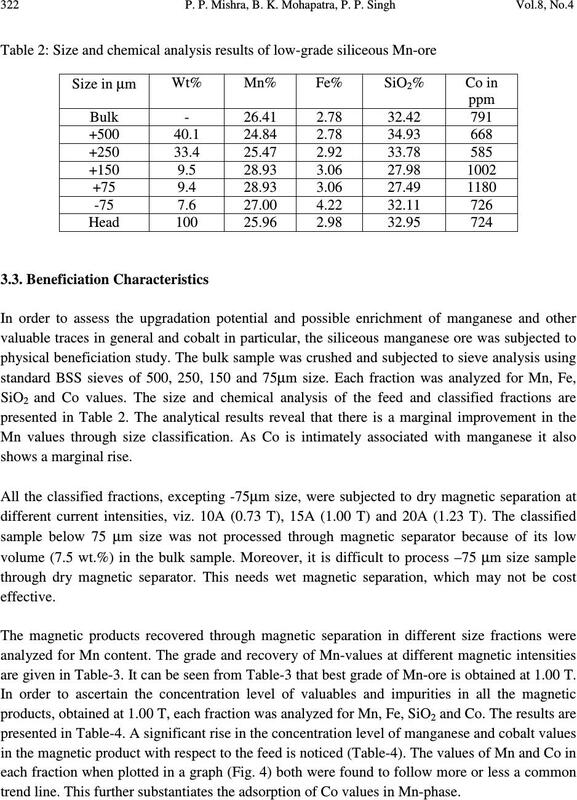 19-23.
separation studies of Chikla manganese ores, Maharastra.” Ind. Min. Eng. J., July, pp. 37-41. 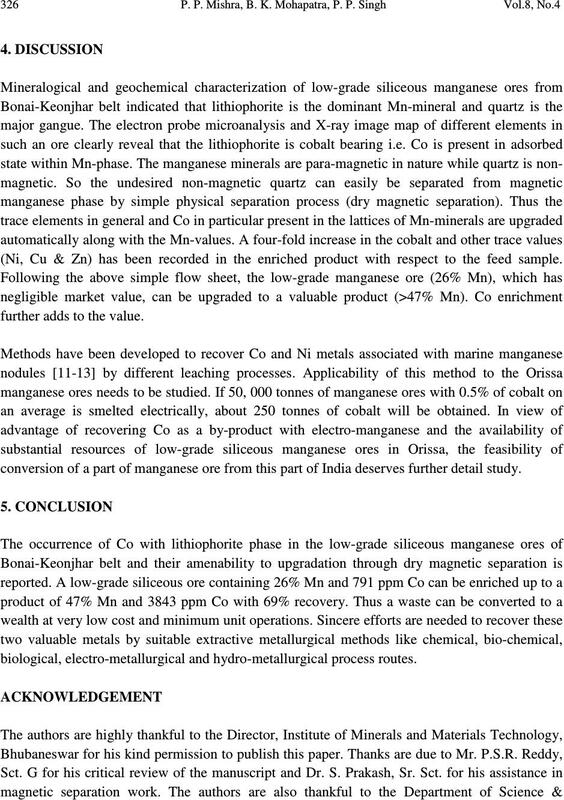 Magnetic and Electrical Separation, Vol. 9, pp. 69-82.
nodules in ammoniacal medium with elemental sulphur as reductant.” Trans. Instn. Min. Met., Sec. C, Vol. 143, pp. 151-155. 272.” Hydrometallurgy, Vol. 49, pp. 47-61.
and Cyanex 272.” Hydrometallurgy, Vol. 54, pp. 117-131.